Holyoke, Massachusetts is a very important place in the history of volleyball. In this city, the education director of YMCA named William G. Morgan introduced this game for the very first time in 1895. Volleyball was actually invented as an alternative physical exercise for older people that cannot really enjoy playing basketball, a fast-paced game that was introduced just four years earlier by James Naismith, another YMCA director in Springfield. William Morgan actually didn't call this game volleyball, he named this game "Mintonette", and that's because in a few aspects like its court and the net somehow related to badminton. This slightly unattractive name later changed after an exhibition match into "volley ball" (yes, that's 2 words). Since the first time it was introduced there were so many changes being made to this game that actually made this game more and more attractive. At the beginning, the number of players on each side were not limited, as long as the court still fits anybody can jumped in. Now only six players are allowed to play for each sides, and this makes the game more effective. Before the 3 touch rule was introduced, there were no limitation for how many times the players can hit/pass the ball before they can pass it across the net to the opponent's team. The next stage of the volleyball history took this game outside of the USA to other parts of the world, YMCA workers who worked in Missionary schools brought this game to Asian countries. The US military brought this game all across Europe during the world war I when they were stationed in many European countries that time. Perhaps some of the most significant improvements in the volleyball history was when the governing bodies of this sport were begin to formed, USVBA was formed in 1928 and followed by the international federation of volleyball in 1947 that helped to improve this game greatly. Those governing bodies made possible for international class tournaments to be held, and this made volleyball gained even bigger popularity and attract a lot of young people, they even started to introduce this game as being a part of physical education program in highschools and colleges. Around the 1940s volleyball was so popular along the California coast, a lot of people play this game when spending their time on the beach for fun. But this fun holiday activity later changed into a new breed of volleyball game played by two players on each side. 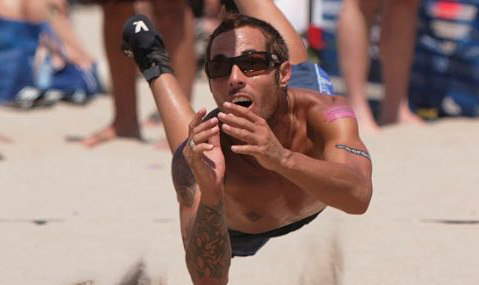 This resulted in the introduction of a new independent sport called beach volleyball. Volleyball finally became one of the sports in the Olympics in the year of 1964. Volleyball is quickly became one of the favorite sports in the Olympic and even more people fell in love with it. Today there are more than 800 million volleyball players in the world including world class athletes like Karch Kiraly, and in fact this game has become the second most played sport in the world after soccer. Understanding the rules, terms, and many important aspects of a game would make it more enjoyable for us to take part in the game or to watch it. Volleyball is no exception, this game has a long list of terms that's being used all this time, and if you want to really enjoy and have a better grasp of this sport then at least you need to understand some of the most standard volleyball terms used during the gameplay. Below I have listed a number of the most common volleyball terms that could enrich your knowledge of volleyball information. Ace: When no opposite team player can touch the ball after being served until the ball hits the ground and gives score to the server. Assist: Helping teammate by setting the ball so he can make a scoring hit, it only counts if the next hit really scores. Attacker: Also known as hitter or spiker which is the player who strikes the ball for scoring attempt. Attack Line: The area about 3 meters away from the net often known as the ten feet line. Back Row Attack: When a player jump from behind the attack line to attack the ball. Block: A move to avoid the opponent's attacker to score by deflecting it back to the opponent's court. Ball Handling Error: A violation when a player consecutively touches the ball twice or lifting/throwing the ball. Bump Pass: Clasping fingers together and using the forearms to hit the ball either to pass it to the teammate or crossing the net. Center Line: A line stretching right under the net that divides the court equally. Dig: The act of saving the ball being spiked by an opponent's hitter by reaching for it and pass it to the teammate. Double Hit: Touching/hitting the ball twice in consecutive. Floater: Serving the ball by jus floating it and then hit without spinning or rotating the ball so the opponent cannot guess the direction of the ball. Jump Serve: Serving by throwing the ball and then followed by a jump hit. Red Card: A card shown by the referee that implies whether a team forfeits a serve or forfeits a point, or a player should leave the game. Rotation: Players moving clockwise to switch position after a serve. Serve: An action to start the gameplay, a player hit the ball from behind the end line to the opposite court. Service Error: When a player doesn't serve correctly, whether the ball touches the net, the ball doesn't successfully cross the net to the opponent's court, the player's foot crossing the line, or the ball goes out of bound. Setter: A player that set a good ball for the attacker to hit and score. Side Out: A team gaining the right to serve after they score or after the opponent made a mistake. Actually there are much more terms being used in volleyball, but as a start you at least have to know the volleyball terms listed here to have a better understanding of this incredible game. Being an international sport that have been known for more than a hundred years, so many exciting facts about volleyball in its history that could be told. These are all exciting information that would be great to know to improve your volleyball knowledge if you are a true fan of volleyball. In this article you will find some of the most interesting facts about volleyball that you probably have never heard of. Some of the most interesting volleyball facts are actually related to the volleyball history. Do you know that volleyball was first introduced in 1895 at Massachusetts YMCA by William G Morgan? This game was initially created to be played by businessmen during their spare time. Back then the rules are very much different than today, the number of players on each side is not limited, and until the year 1920 the players can still hit the ball more than 3 times as much as they need. Volleyball have travelled far away from its origin in the USA, even some of the most significant improvements of this sport was started outside of the USA. Set and spike were started being used in the Philippines in 1916, and this offensive play made volleyball became more interesting and physical, that's why NCAA then altered the rules of the game and started to bring volleyball to high schools and colleges. Another important improvement was made in Bulgaria when the first governing body of volleyball was established, The USA followed 8 years later by forming the United States Volleyball Association (USVBA) in 1928. The enhancements of volleyball game play and rules didn't end there, you can still find many facts on volleyball history in this article. At first, the height of the net is only 6'6" before it was raised to 7'11 5/8", and back then, "volleyball" is not even the name given for this game, this game was introduced by the name "mintonette". One aspect of this game that probably gone through the most changes is the rules, the back row attack started being used in 1920 and another rule of forearm pass following being implemented for the first time in the 1940's. Today volleyball has become one of the most popular sports in the world after being played in the Olympics in 1964. Over 800 million volleyball players in the world today, and this game has earn the predicate of the most played sport in the world next to soccer. Hopefully the facts about volleyball could enrich your knowledge about this game and make you love this sport even more.